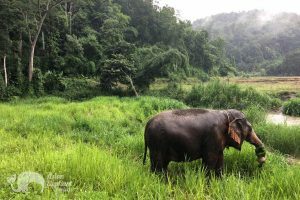 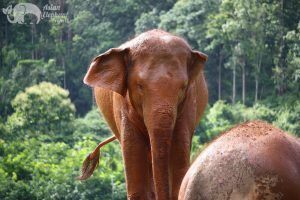 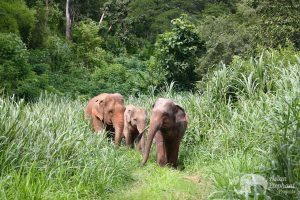 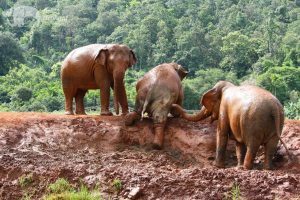 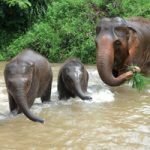 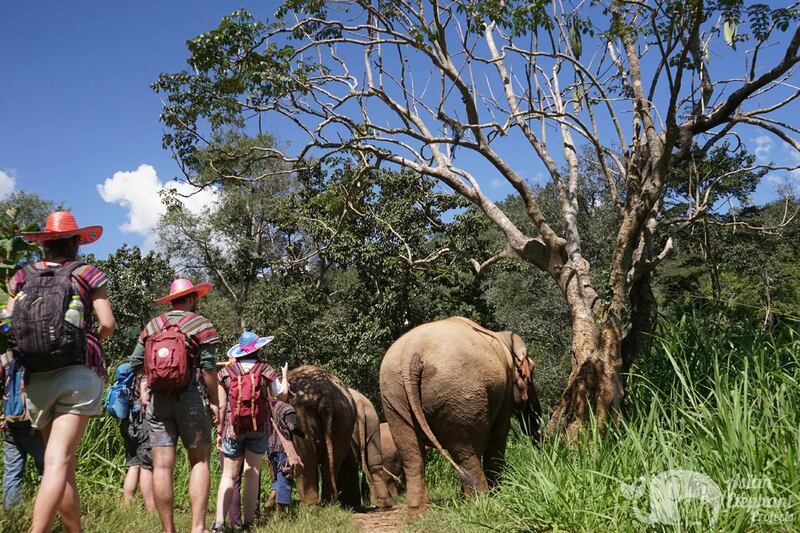 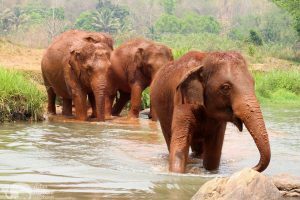 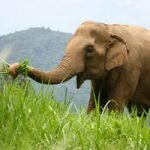 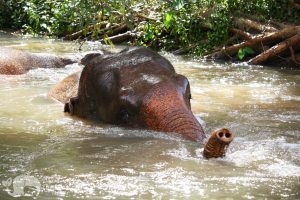 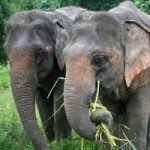 Join this elephant tour near Chiang Mai for an unforgettable experience with elephants living in sanctuary amid stunning natural surroundings. This family run project is a great example of elephants experiencing happier, healthier lives thanks to the evolution of elephant tourism, supported by growing numbers of people choosing to see elephants living a more natural existence. 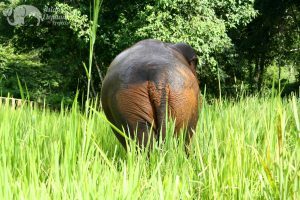 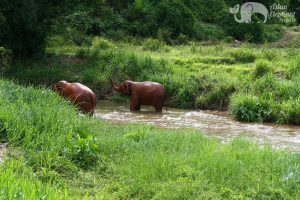 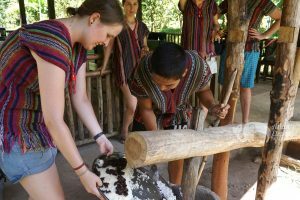 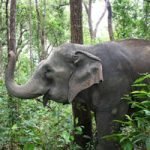 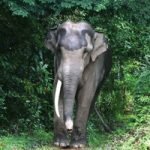 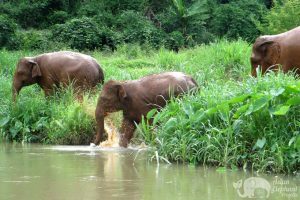 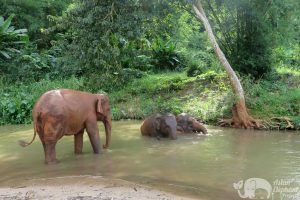 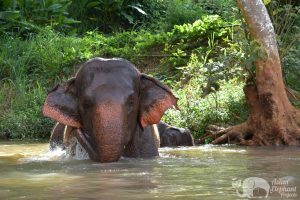 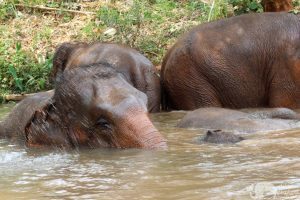 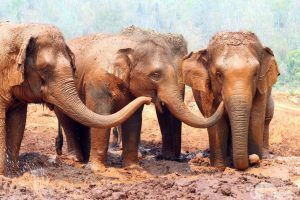 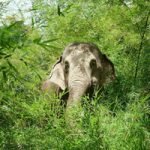 When you visit this project, you will encounter a herd of elephants doing what comes naturally — walking in the forest, foraging, playing in the mud and river, and socializing — a rewarding experience that takes into account the well-being of elephants. 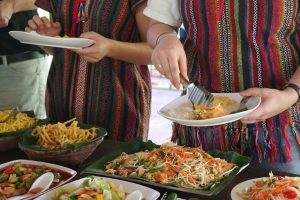 Between activities, a delicious vegetarian buffet lunch is served overlooking the valley with a panorama that takes in a stream, farmland, and surrounding jungle. 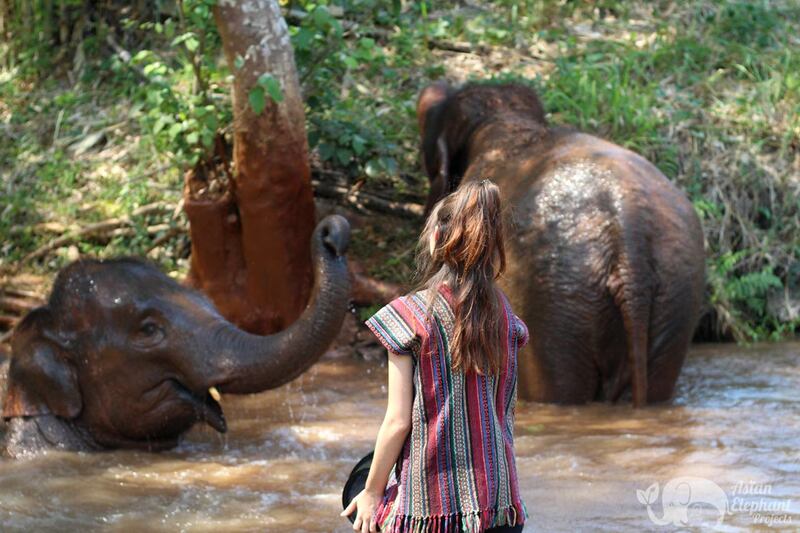 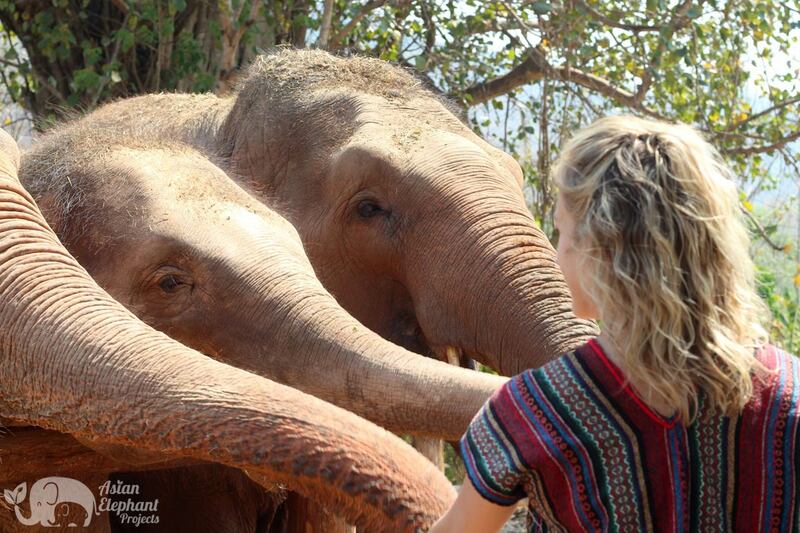 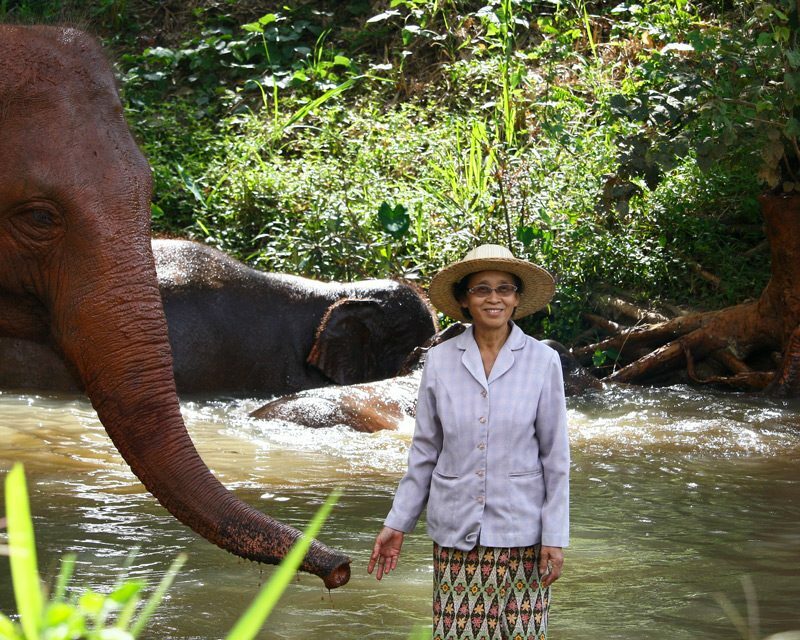 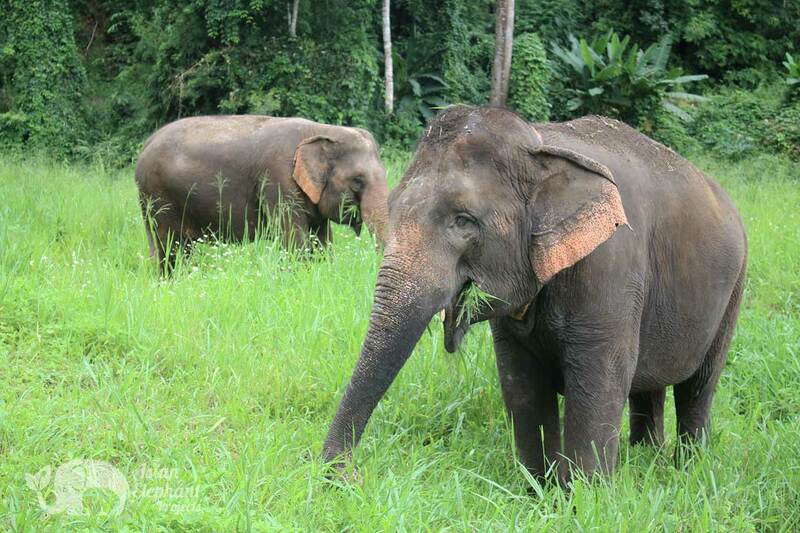 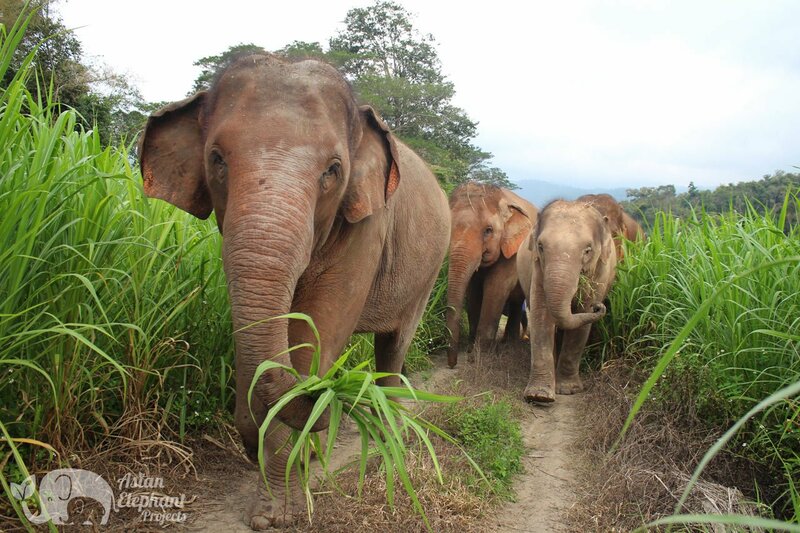 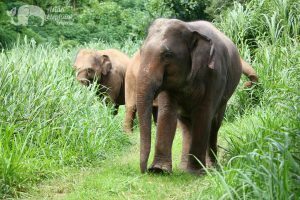 There are currently four elephants at this project – all females retired from elephant riding. They have formed strong friendships thanks to being able to relax and socialize as a herd. 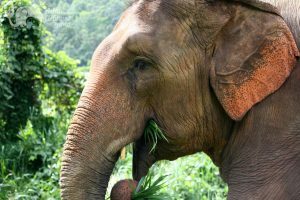 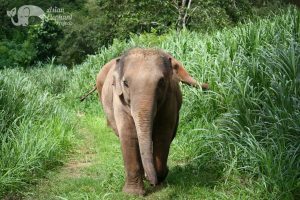 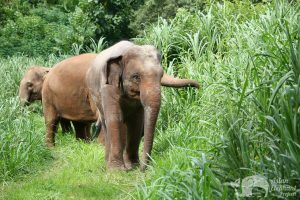 The owner has a small banana and longan plantation and grows tall grass to help provide food for the elephants and also buys sugarcane, pumpkins, and rice husks from local village farmers, which helps support the local community. Start: 8:00am – 8:30am pick up from your Chiang Mai city hotel, or from our office at 7:45am. If staying out of town (outside the middle ring-road) additional charges apply. 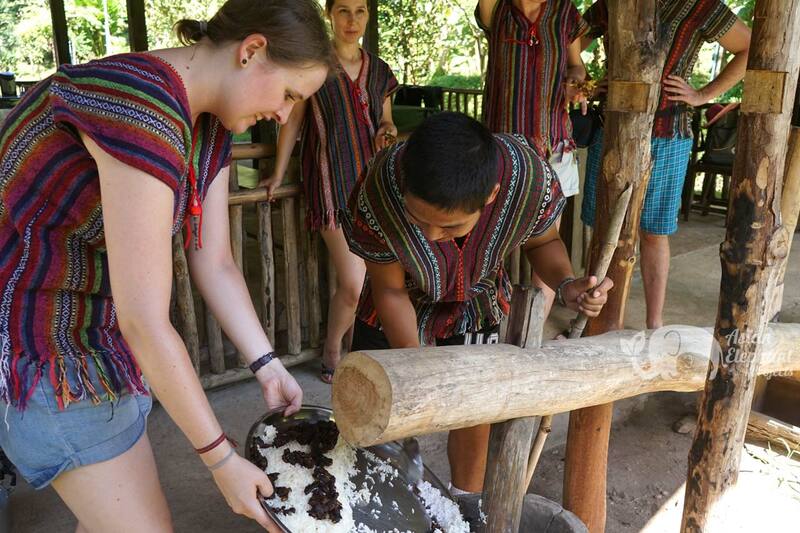 Please advise on your reservation form. Travel Time: Around 90 minutes (a safety video and elephant documentary will be shown en route to the project). 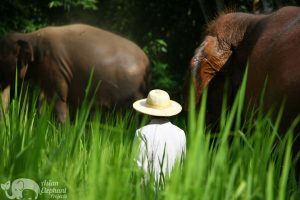 Travel Details: Transfer from an air-con minivan to a 4WD pickup for the last 5-10 minutes of your journey to the project. What to Bring: Hat, sunscreen, sandals/flip flops, walking shoes, change of clothing (as you may get muddy or wet), towel, camera & insect repellent. Age Suitability: Adults and children over 7 – guests under 18 must be accompanied by an adult. 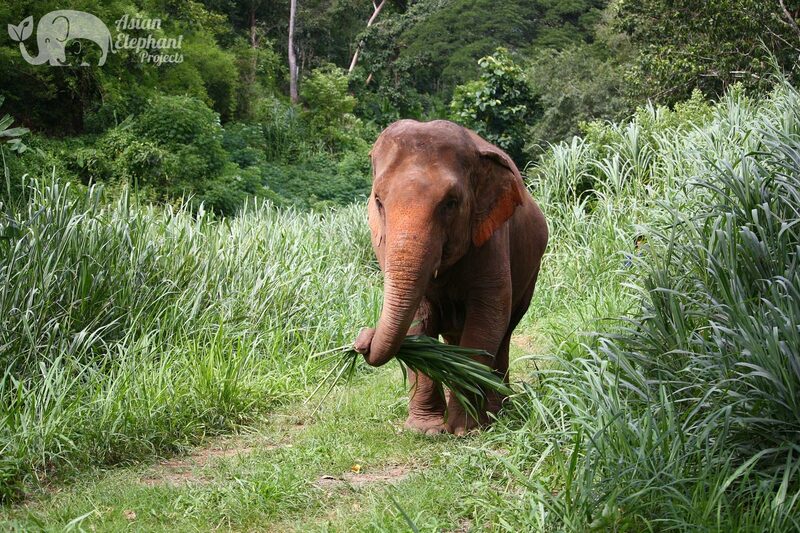 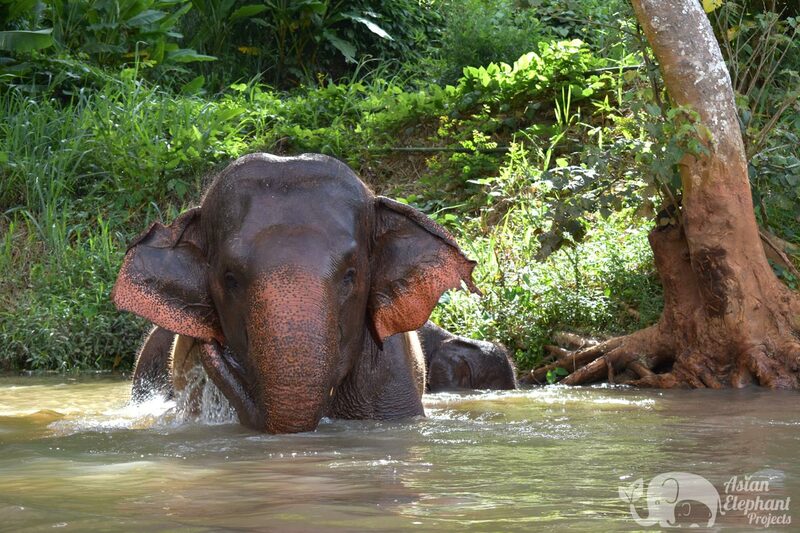 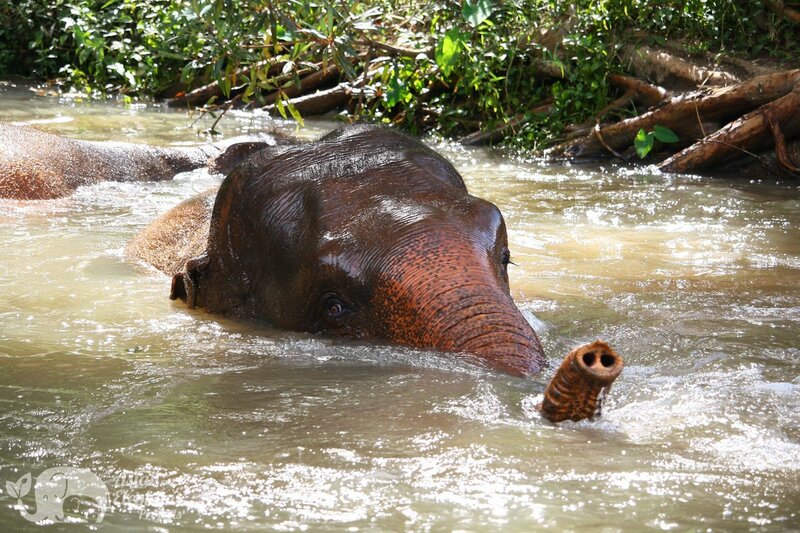 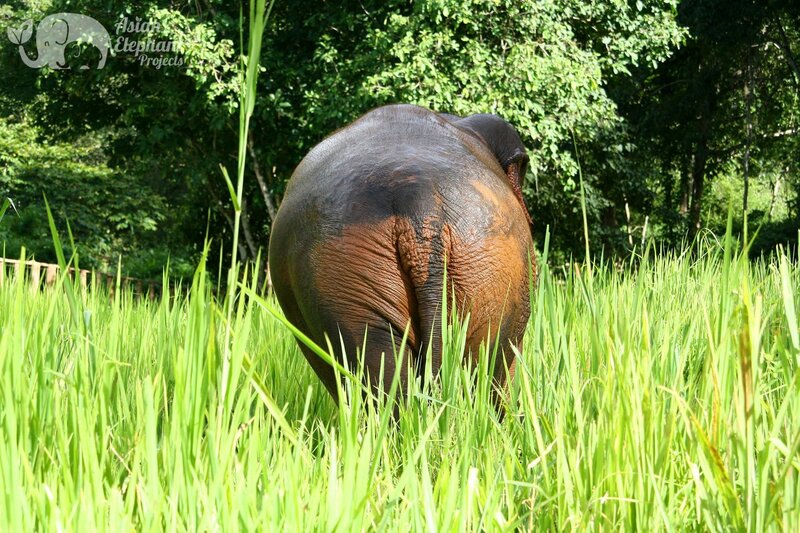 Fitness Level: Easy – walk through orchards, grassy fields, forests, and by a picturesque stream with the elephants. Topography: Forest, hills, grassy fields, orchards and river. 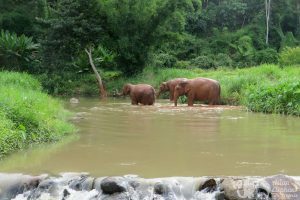 Location: Mae Wang, South of Chiang Mai, Northern Thailand. 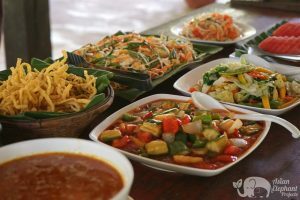 Nearest Airport: Chiang Mai (CNX) – we recommend you stay in Chiang Mai city the night before your visit. 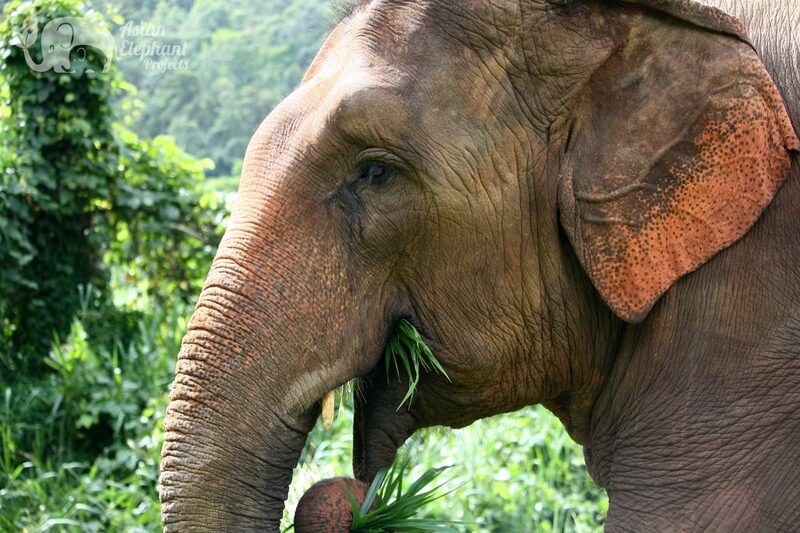 Please note that we cannot collect you from Chiang Mai Airport – only from your Chiang Mai city hotel / guesthouse. 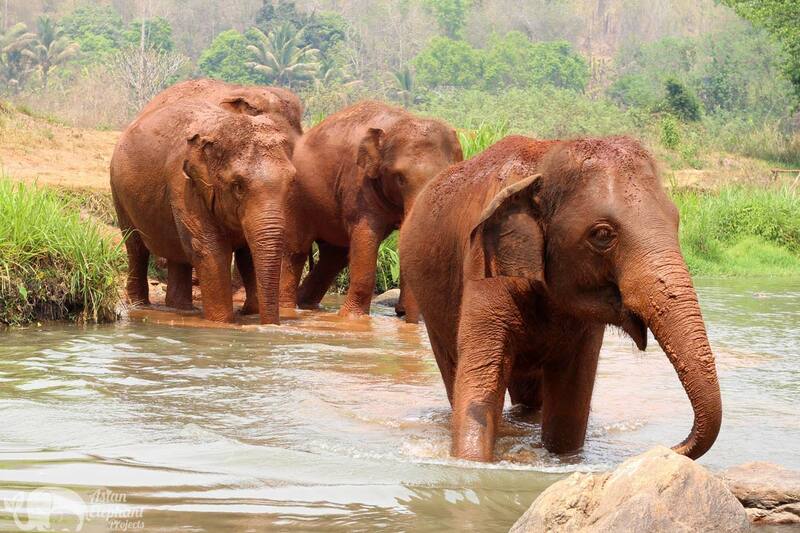 This is a small ‘Saddle Off’ project with a limited number of guests. 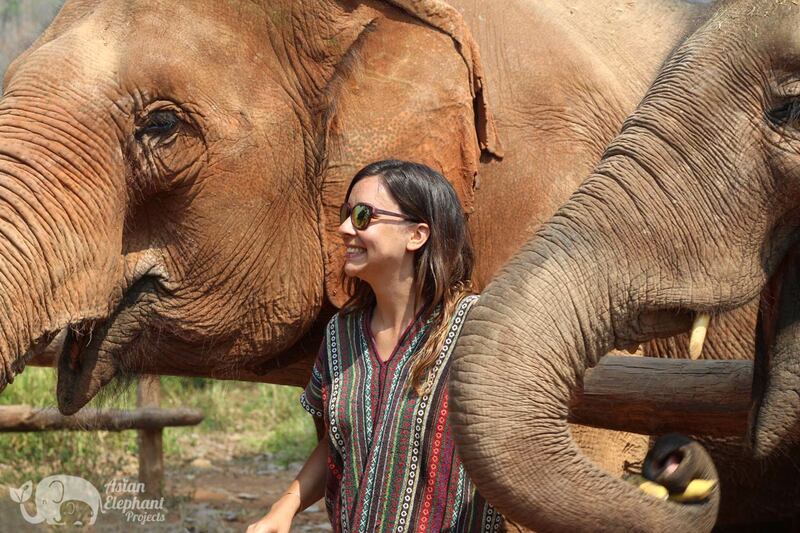 Our model is based on ensuring the well-being of the elephants, which means no riding or other unnatural activities. The owner of this project, Pin, became involved in elephant tourism almost 20 years ago, starting with one elephant. 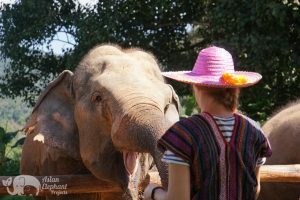 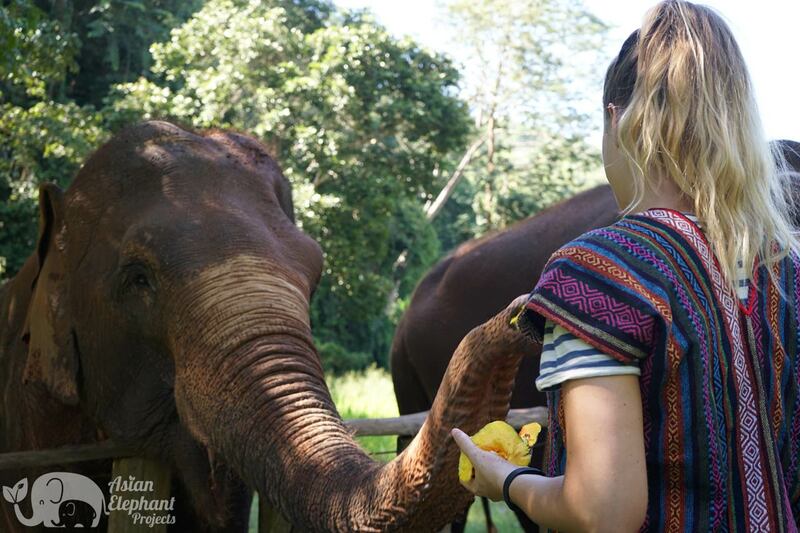 When Pin heard about the ‘Saddle Off’ initiative a couple of years ago she decided to drop elephant riding and embrace this alternative approach based on kindness. 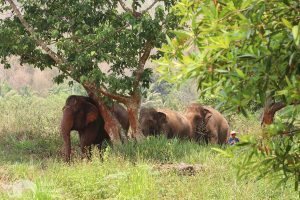 Since then, the elephants at the project have relaxed into their new life and are enjoying being able to socialize freely and forage in nature. 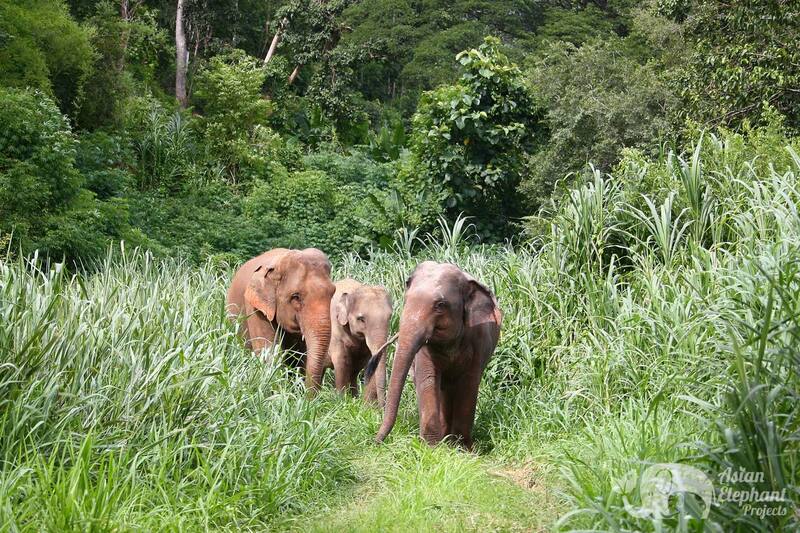 The herd is led by the matriarch, Ta Be, born in 1962. 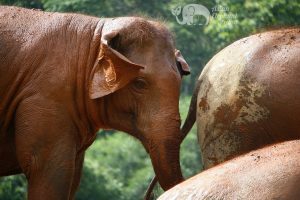 The rest of the herd is made up of Faa Sai, who was born in 2010, her sister Jenny, born in 2006 and Faa Sai’s best friend, Kham Moon, born in 1991. 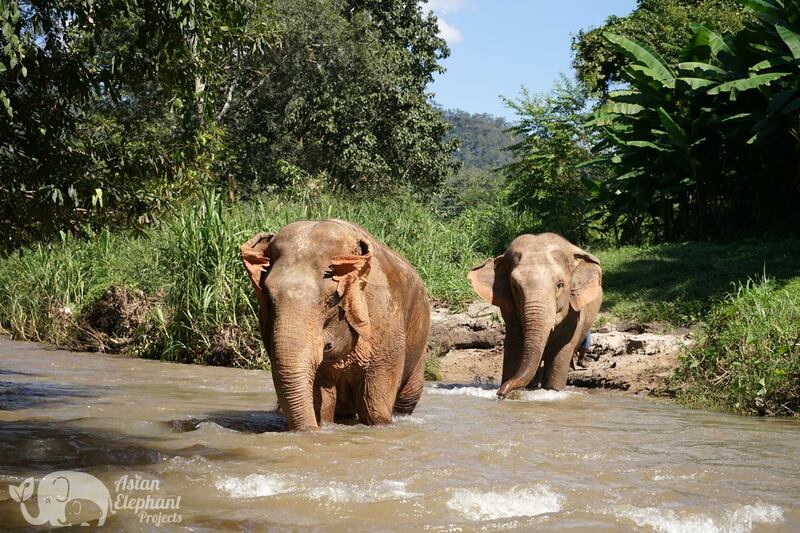 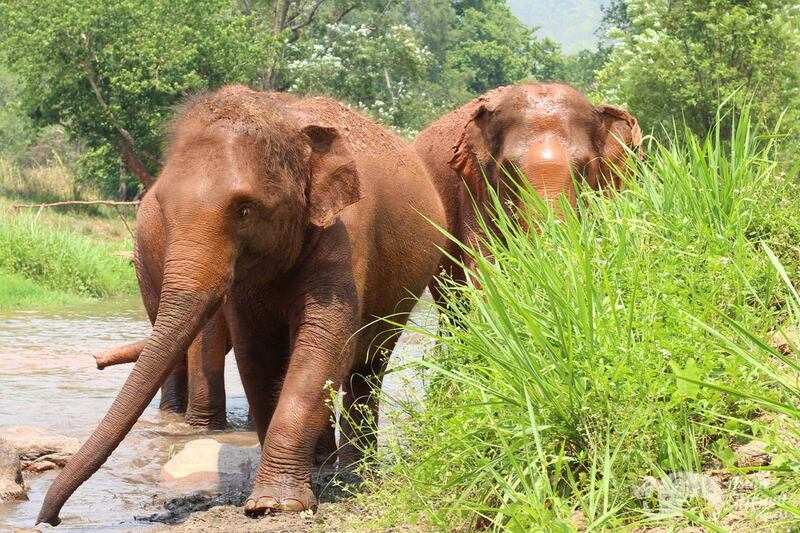 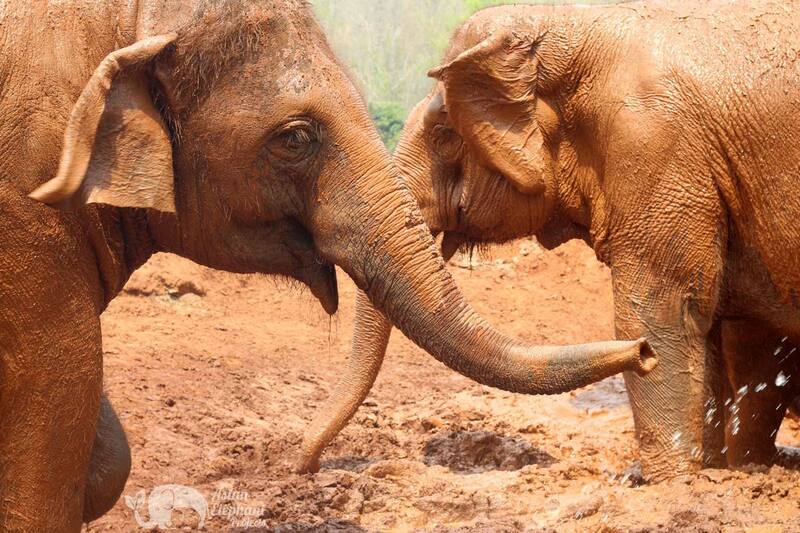 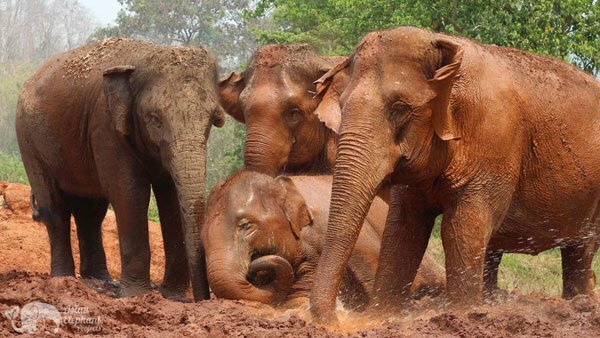 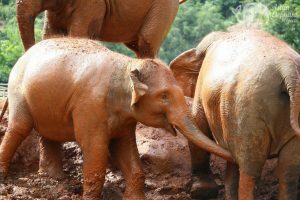 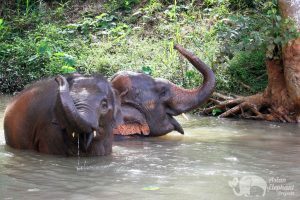 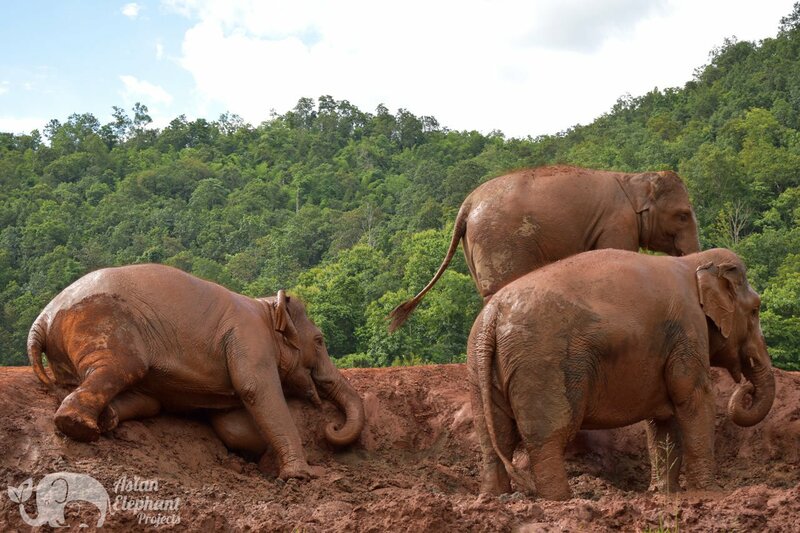 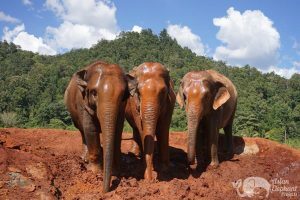 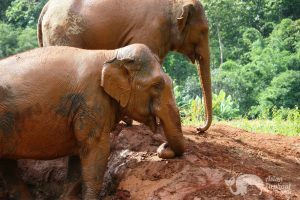 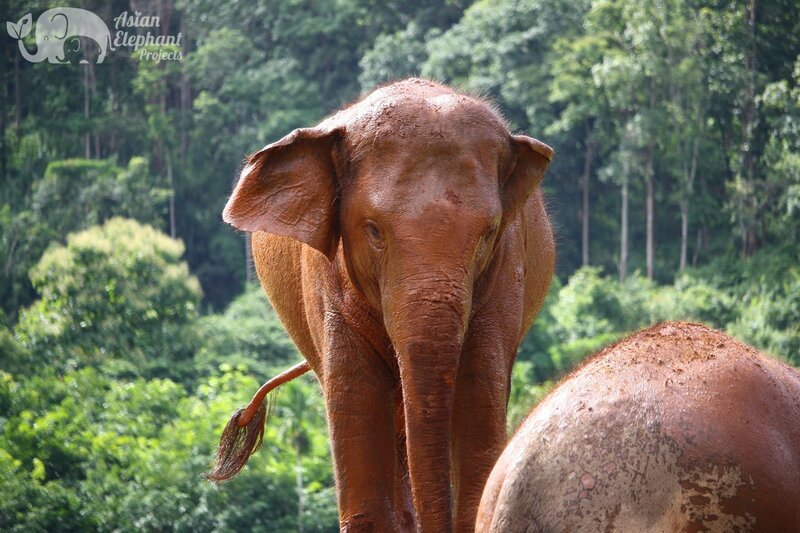 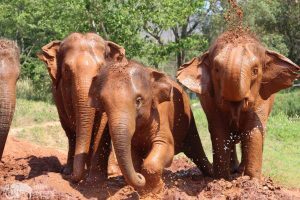 Faa Sai and Kham Moon love to play in the mud together. 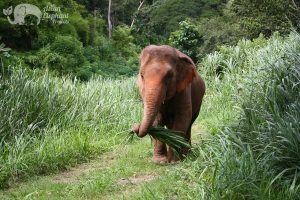 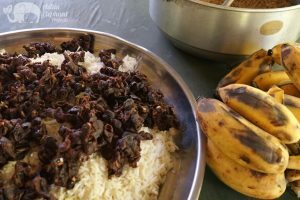 Bananas and tall grass are grown at the project and they also buy food from the local farmers to whom they supply elephant dung to be used as organic fertilizer. 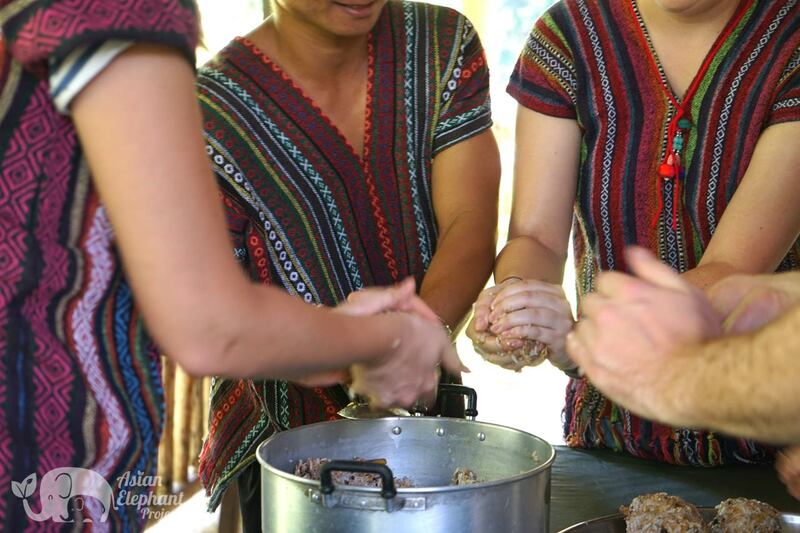 Pin is supported by her family in the running of the project, including her daughter, Jang, and her sister, who cooks delicious food for the guests.